Exciting San Antonio River Walk HotelExperience the historic ambiance and friendly service of Holiday Inn Express San Antonio River Walk Hotel, located downtown in the remodeled 1878 Bexar County Jail building.Our San Antonio, TX hotel is your gateway to the city's most iconic attractions. We're situated in walking distance to the scenic River Walk, San Antonio Missions a UNESCO World Heritage List. Historic Market Square. Event attendees also enjoy a quick half-mile trip to the Henry B. Gonzales Convention Center. Hop the famous trolley for an easy ride to attractions such as the Alamo, Tower of Americas, and the Alamodome.While great for leisure, we also benefit our business guests. A centrally located San Antonio hotel in downtown, we're located near Valero Energy, Coca-Cola and Pepsi, Boeing and Fort Sam Houston. The benefits continue on-site, with free high-speed Internet and a 24-hour business center.Whether business trips, family vacations or romantic getaways in San Antonio, TX, our freshly appointed rooms welcome you. Upgraded amenities like our spacious guest rooms with microwave and min-fridge, and flat screen TVs. You'll find lots to love throughout our Riverwalk hotel: a sparkling pool, fitness center and Express Start Breakfast Bar every morning. 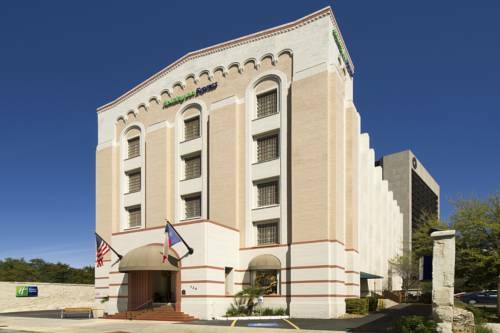 Stay better and save more with our San Antonio hotel deals.A refreshing stay in the heart of it all that's Holiday Inn Express Riverwalk Area hotel! Located in Market Square in Downtown San Antonio. Enjoy steak and seafood in downtown San Antonio. Enjoy authentic Mexican food or delicious freshly baked traditional Mexican pastries. Fine Mexican cuisine located downtown in the historic King William District. Enjoy authentic Old World cuisine that combines classic French and German techniques with a touch of New Orleans located in downtown San Antonio. Enjoy authentic Mexican cuisine while relaxing on the private patio overlooking the water in downtown San Antonio on the River Walk. Enjoy a large selection of American cuisine while having an adventure in this tropical paradise with the entire family. Enjoy traditional Italian cuisine in a relaxing yet refined atmosphere located downtown San Antonio on the Riverwalk. Enjoy this authentic Brazilian Steakhouse downtown in the heart of San Antonio. Enjoy one of San Antonio's favorite Mexican food restaurants located near downtown San Antonio. Enjoy this seafood Texas bistro located right on the Riverwalk or arrange to have dinner on one of their special river barges. Enjoy San Antonio's premier micro brewery and full-scale brewpub. Blue Star specializes in hand-crafted beer such as a stout pale ale and the King William Ale. Blue Star also offers live music, a late-night show, Spurs' games and bike rentals. Known for it's rowdy atmosphere and Coyotes (female bartenders) Coyote Ugly Saloon is one of the most famous bars in the United States. The San Antonio location is in the heart of downtown, just steps away from the River Walk. Children's program - San Antonio's Children's Museum is located on Houston Street 3 blocks east of the hotel.